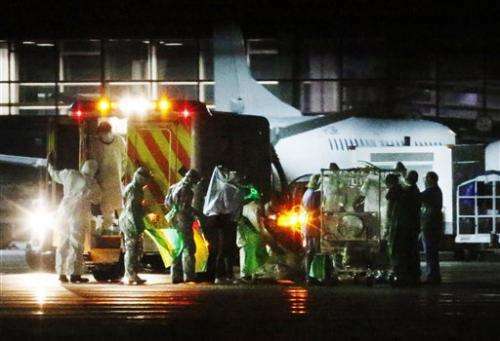 Britain's Ebola screening procedures should be improved, the country's chief medical officer said Wednesday, after a nurse was cleared to fly hours before she was diagnosed with the disease. Nurse Pauline Cafferkey flew from London to Glasgow on Sunday after returning from Sierra Leone. Her temperature was taken seven times at Heathrow Airport—once on arrival and six times after she told staff she thought she might have a fever. Her temperature was found to be within the range defined as acceptable, and she was allowed to fly to Scotland. Cafferkey developed a fever Monday and is being treated in an isolation unit at a London hospital. A doctor who flew back from Sierra Leone with Cafferkey, Martin Deahl, has criticized the Heathrow screening, saying there were too few staff and the medical workers were not segregated from other passengers. Chief Medical Officer Sally Davies said that "the process does seem to have not been as good as we all want to see." But she said Cafferkey had not been showing symptoms and posed little risk to fellow passengers. She said screening procedures for people returning from West Africa are being reviewed. Cafferkey is the first person diagnosed with Ebola on British soil. Doctors at the Royal Free Hospital in north London said she was being treated with an experimental antiviral drug and with plasma from a recovered patient containing Ebola-fighting antibodies. Infectious diseases specialist Dr. Michael Jacobs said Cafferkey was sitting up and able to eat, read and talk to her family. He said the patient was in "a positive frame of mind," although "I'm sure this isn't how she intended to spend New Year's Eve." Since an Ebola outbreak began in December 2013 in the West African country of Guinea, there have been more than 20,000 cases and more than 7,800 deaths, mostly in Liberia, Guinea and Sierra Leone.